The Intelsat 32e (IS-32e) satellite, which hosts the SKY Brasil-1 payload, is a DTH satellite. DIRECTV will utilize the SKY Brasil-1 payload capacity to expand the delivery of high definition, 3-D television and cinema programming throughout Brazil. 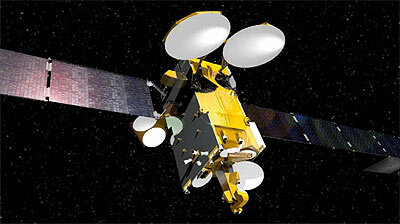 For YahSat, a Ka-band payload will be on board. Intelsat 32e / Sky-Brasil 1 will provide broadcasting services through up to 60 Ku-band transponders to Brazil, ensuring continuity of legacy services countrywide, while at the same time expanding into new services such as HDTV. To do so, it will be capable of providing overall coverage across Brazil, as well as regional television channels through 20 spot beams. Nearly half of the Ku-band transponders is owned by Intelsat, the others by DirecTV. Yahsat is the owner of 21 Ka-band transponders to develop Yahsat’s broadband business in Brazil. It was built by Astrium and based on the Eurostar-3000X platform has a mass of approximately 6 t at launch and electrical power exceeding 16 kW.. The satellite is equipped with 81 transponders operating in the Ku- and Ka-bands and will be placed at the 43° West orbital location. It is designed to have a nominal orbit lifetime of over 15 years.